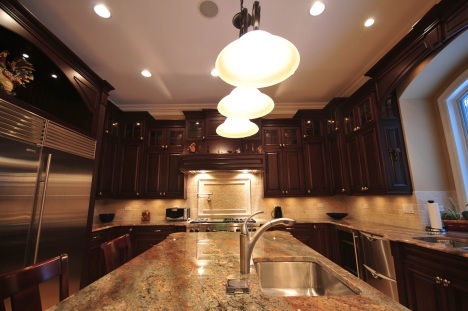 Granite Countertop Care | Planet Marble Granite & Tile Inc. Granite countertop care and maintenance comes down to just a few simple steps that will keep your granite countertops looking like new for years. Polished granite will not lose its shine and will not scratch from normal wear. Here’s how to keep that polished luster and care for your granite countertop. The easiest way of cleaning granite countertops is to simply use warm water and mild, phosphate-free, biodegradable liquid dish soap, preferably light-colored and containing no aromatics. This is a gentle way to clean the grease and grime from your granite counters without damaging them. If you use plain soap and water, this can lead to soap build up and over time, will dull the glossy finish of your polished granite. After cleaning you should rinse the countertops thoroughly and dry with a cotton cloth. Never use powdered cleansers to clean your stone as they contain pumice which is an abrasive. Never use acidic cleaners that may include ammonia when cleaning granite countertops. You can also buy special mild granite cleaners specifically designed for cleaning stone. Granite is extremely hard but like any natural stone, it is slightly porous. Anything acidic can etch the glossy surface and oils can soak into an unsealed top, so it’s important to quickly clean up spills like wine, oil, mustard, citrus or chemicals before they can soak into the surface or damage the gloss. Although water left to puddle on the surface of the granite will leave a dark stain, this will disappear when it dries out completely. To be safe, we recommend sealing granite countertops to reduce absorption of oils and liquids that may stain the granite. Planet Marble and Granite recommends using a good granite countertop sealer to help block the absorption of liquids and oils that can stain your granite top. Our #1 piece of advice for granite countertop care is to seal your granite countertop using a natural stone sealer. A good way to check the state of sealer on your granite surface is to sprinkle some water on your countertop. If it doesn’t bead up but soaks into the stone it needs to be re-sealed. This can be done once a year or as necessary. Applying the granite countertop sealer is as easy as wiping it on, using a soft cotton cloth. The sealer is absorbed into the microscopic pores of the granite and is safe for food handling. Marker stains can often be wiped away using acetone or lacquer thinner, especially on dark granite colors. If you have a light color granite installed you can also try hydrogen peroxide instead. A good way to remove stubborn granite stains is to use a poultice, which will draw out the stain or oil from the granite into the poultice. Try making a mixture of dishwashing liquid and water, thickened with enough flour to make a paste. Apply this paste carefully to the stain and cover with plastic to keep it from drying out too quickly. Leave overnight and scrape away with a wooden utensil to avoid scratches. If the granite stain is from oil, you can try the same poultice but substitute hydrogen peroxide for the dishwashing liquid in the above formula. For stubborn oil stains try placing a hot, wet, terry cloth towel on the stain, then place an iron on full steam on top of the towel. This will help break down the stain and you can then use the poultice to draw out the oil. Organic stains from food can be attacked by adding a few drops of ammonia to the mixture. An quick and easy thing to try is to sprinkle cornstarch on the stain and let it sit for 18 to 24 hours. Afterwards, vacuum up the cornstarch and repeat the process as needed. For a professional approach, try StoneTech Professional Oil Stain Remover. At our Planet Marble and Granite showroom, we can help you with advice about cleaning granite countertops and sealing granite countertops. All our granite countertops are sealed after installation and we can recommend quality products for granite countertop care and maintenance. Please use the form below to request a FREE ESTIMATE from Planet Marble Granite & Tile. We will get back to you shorty! Visit us on Facebook, Instagram, and Twitter to stay tuned with our latest offers and promotions! Planet Marble & Granite Inc. Planet Marble Granite and Tile accepts the main credit cards: Visa, MasterCard, Discover and American Express; for your convenience.